A while back, I had business cards made up. They’re not too bad. The Vista Print special for the day. Nothing that took a designer to build, but not exactly shabby, either. They focused more on my website than on me as a writer, which is okay, I guess. I haven’t settled on a pen name (for real) yet, and at the time, I was still up in the air, even as far as genre goes. There are a lot of experiments rotting on my hard drive. I’m happy with some of them, and less happy with others. 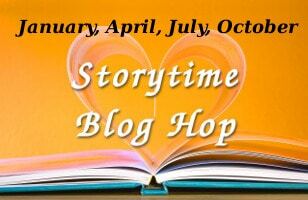 And maybe that’s just a part of sussing out what your themes–what your real, core stories are, and what the best way of telling those stories might be. So, I have business cards. They don’t have my name on them, and they aren’t all that specific about genre, but they exist. They do highlight the website nicely, albeit as something I hope it will one day become. They do not, for instance, have my Twitter account on them. So, at some point , I actually saw a few writers’ business cards, and it turns out, they’re not nearly as difficult as I thought. Name, pen name, email, website, and some social media information. Maybe a genre, and maybe not. Maybe a tagline. Obviously, my tagline would be Writing… Ask me what, when I make up my mind. I’ll probably order replacements before I go out again. 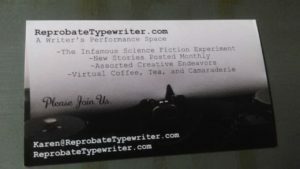 So, do you have writer’s business cards? If so, what’s on them? Am I the only one dying to see pictures of the business cards?! Apparently not; I got a couple of requests, so I posted a picture of mine. I don’t have writer business cards, but back when I was networking I made my own. You can get the cardstock at Staples or Office Depot Max, and practically every word processing program has templates for each of them. And yeah, let’s see your card! Okay, I’ve updated with a picture of the thing, if you really want to see it. Thanks for jogging my memory, I still haven’t got around to ordering any. However, like you I was going to order mine from VistaPrint.